The first group of students emerging from a Pima County-led program training them for STEM-related fields is now securing internships with companies that range from aircraft maintenance providers to labs offering chemical analysis. The program got its start when employers in the growing fields of biotechnology, aviation, health information technology and industrial technology said they needed more well-trained employees. That’s when Pima County’s One-Stop Career Center/Arizona@Work reached out to area partners to develop comprehensive curriculum and training programs to fill that science, technology, engineering and math (STEM) pipeline. The One-Stop administers the programs for more than 360 high school students across Southern Arizona. Many of the students from that first group are on their way as first-year students at Pima Community College as part of a $5.4 million Youth Career Connect program supported by the U.S. Department of Labor through June 2018. Other partners are the Pima County Joint Technical Education District (JTED), the Sunnyside and Tucson Unified School Districts, Pima Community College, and nonprofit partner, Tucson Youth Development. Pima County is the grant awardee on behalf of Innovation Frontier Arizona, which also includes Santa Cruz, Cochise and Yuma counties. Local business partners who have opened their doors to the student interns include: SynCardia Systems, GAAS Analytical, Xeridiem, Eye Care and Cure, Industrial Tool Die & Engineering, PSE Archery, Airtronics, Abrams Airborne Manufacturing, Sargent Aerospace & Defense, FLSmidth Krebs, Rincon Valley Fire District, Bombardier, Ascent Aviation Services and many more. Two additional groups of students are getting hands-on experience at the Pima County Regional Wastewater Reclamation Department (RWRD) Bio Academy Program. 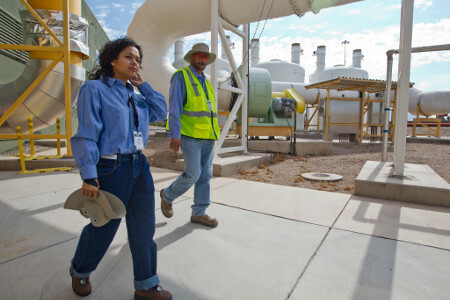 RWRD is offering two four-week sessions with up to 20 students earning six credits in Wastewater Collection Systems from Pima Community College. “This is about Pima County and the Board of Supervisors being committed to the economic development of this region by responding to critical needs in the business community. Through some unique collaborative efforts involving multiple schools, businesses and agencies, we’re making real strides toward developing a well-trained work force,” said Nils Urman, who manages the Youth Career Connect (YCC) program. 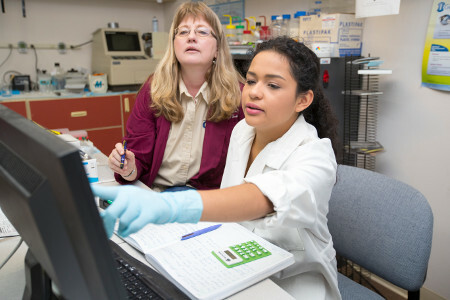 Once students enter the program, they have access to many additional benefits such as extended work skills workshops, field trips, mentorships, internships and assistance with cost at Pima Community College within the projects designated STEM pathways, explained Gerri Brunson, a workforce development specialist for the One-Stop and the program coordinator for the YCC grant. The first crop of students came into the program in fall 2014, with support from teachers, counselors and parents. Seventy-five local students who entered the program in 2014 are working this summer at paid internships, gaining on-the-job experience and fulfilling career goals. One of them is Sunnyside High School graduate Alondra Ceballos. Ceballos spent last summer in the biotechnology program at the County’s Wastewater Department (see top photo). This summer, she is interning with GAAS Analytical, a local firm offering analytical chemistry services, particularly to the dietary supplement industry (see middle photo). “I run samples of vitamins and other products to verify their chemical makeup,” Ceballos said. She’s balancing her internship with classes at the University of Arizona’s NewStart program for incoming freshman. This fall, she’ll attend the UA full time as a public health major. Ceballos’ boss, Anikó Sólyom, is pleased with the progress her young intern is making. For her, the partnership with workforce development and the school districts is payback for when her son, now a senior in college, was looking for a high school lab experience. Ascent Aviation took on two students as part of the aviation program through Pima JTED. 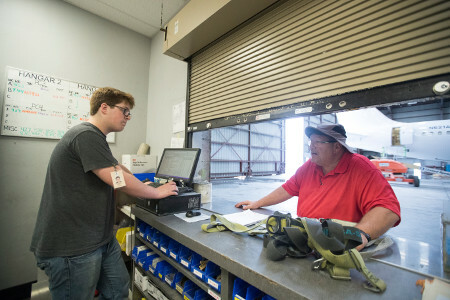 John Owen, Ascent’s director of quality, said the students are helping with records maintenance since they can’t be on the hangar floor because of age restrictions. Early each school year, teachers and counselors from the school districts encourage a new group of high school juniors to join the program. By the end of the four-year grant, approximately 900 students throughout Southern Arizona will have benefited from the project. Industrial Technology - Desert View High School and Tucson High Magnet School. Parents and students wishing to learn more about any of the programs can email Gerri Brunson or call her at 520-724-3733.